Julep It Girl Intro Box Review - Polish Etc. What a horrible blogger I have been this week! I have been finish up my graduate classes and trying to get organized for summer research and I ran out of backup posts. Well I'm back now and I have plenty to show you. I've purchased quite a few wonderful indie polishes from Etsy and purchased supplies to do my own frankening. Today I'm going to show you my Julep Maven It Girl Intro box. I decided after much debate to try out Julep nail polish. I've seen Julep all over the place but never wanted to fork out the cash ($14 + shipping for one bottle of nail polish?). While browsing the internet, I saw the penny deal: get a Julep Maven intro subscription for just $0.01. Seems too good to be true right? Well it's not. I checked my credit card statement and I was charged for $0.01 exactly! There doesn't seem to be any catch to this awesome deal. They shipped it to me fast and here are the results! With a nail file and three bottles of nail polish, Heather, Mandy, and Helena. First up is Heather, described as: "chic platinum greige with a metallic glow." I'd say this one is a graphite grey metallic shimmer. The finish has obvious brushstrokes, but with careful application that wouldn't be a problem. Two coats + base coat for this photo. Heather really isn't a "me" color but it is pretty and the application was great. 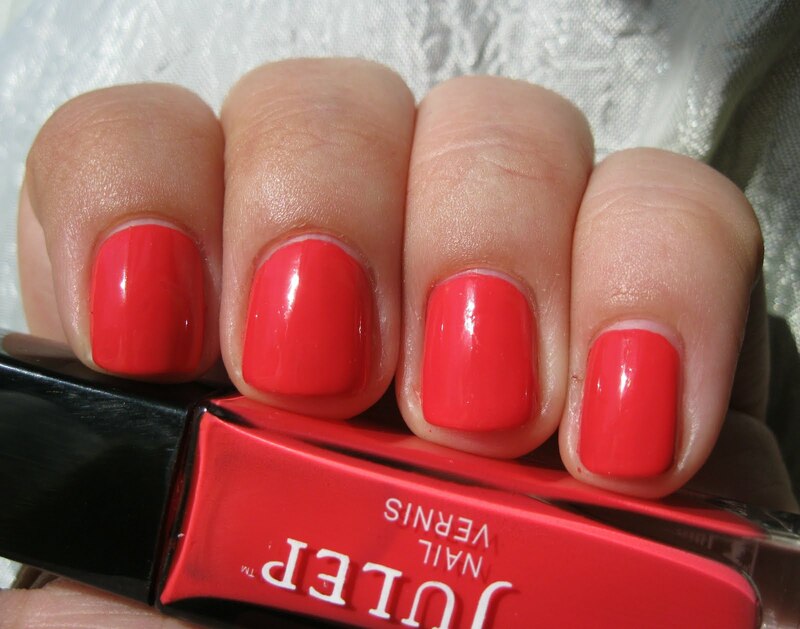 Mandy is my favorite of the three, described as: "fresh, bright, deep coral-pink." This color is absolutely amazing. It's such a pretty color and just says SUMMER to me. It looks beautiful and bright on my fingers and I can imagine it would be a great pedicure color. It's a bit more pink than some corals (such as OPI's On Collins Ave) and did I mention absolutely gorgeous? The formula was perfect, thick and pigmented, this is two coats and top coat with no base coat. Helena is equally gorgeous, described as "ultra-saturated fuchsia. Looks great on all skin tones." It's a great fuchsia, and it didn't significantly darker than the bottle color. In my experience most polishes this color dry matte and much more red than the bottle color, but Helena is pretty bottle accurate. This photo, on the other hand is not color accurate. I tried it outside, inside, fluorescent lighting.. but my camera can't seem to capture this color. I used to think that Julep bottles looked a bit awkward because they are long, narrow, and square. After having some they are really quite nice! They have thick glass, so they are really nice and solid. The bottles nest together nicely because of the square sides and the narrow squared lid has the perfect grip for manipulating the brush. Aren't they nice?